The Insulated Concrete Form (ICF) continues to grow as a viable alternative construction method to traditional stick-built construction. With all of the benefits that ICFs offer, such as energy efficiency, durability and sound deadening, they do present some very intriguing issues for the other trades, one of those being the waterproofing systems. To really understand the issues that ICFs present, let’s take a brief look at the components, how they go together and final structure created by these components. First, the foam insulation panels or blocks that form the concrete wall are stacked poured, and then left in place after the concrete sets. These forms can be made out of expanded polystyrene (EPS), extruded polystyrene (XPS) or closed cell polyurethane. Each manufacturer will have some type of specially designed edge on the top and bottom of the blocks which is intended to help lock the them together and keep the concrete in the cavity wall area. Where panels are used, some form of tie will be used to hold the panels together and create a cavity for the concrete to be pumped into. Whether using a block or panel design, some type of bracing system will be used to secure the walls while the concrete is pumped into hollow core of the wall. Concrete placement is usually done in more than one lift, which allows for better consolidation of the concrete, using vibration to minimize air pockets. 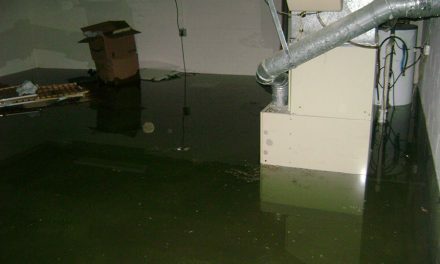 In many cases, a “cold joint” is inadvertently created in the concrete wall between lifts, which may allow water to seep through. Also, because all concrete shrinks as it cures, there will always be some very minute gaps between the concrete wall and the ICF. The interlocking edges of the panels or blocks are points where water can penetrate. The skin (polyethylene film) surface of the ICF is extremely difficult to adhere to, especially with construction dust that is usually present. The panels or blocks (ICF units) are often damaged during shipping or erection and must be patched prior to waterproofing. 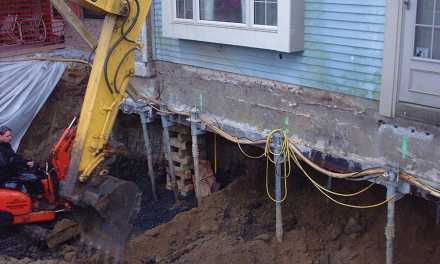 The ICF material and waterproofing can easily be damaged with the native backfill which is typically used. 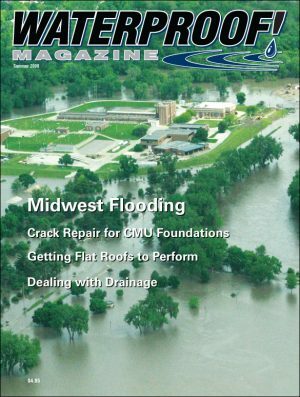 The ICF wall, because of the nature of its structure—which often includes cold pour joints, air pockets or voids in the concrete and shrinkage of the concrete away from the ICF—has many channels that water can migrate into and through. This is especially true if the water is driven into the wall by hydrostatic pressure. All of these factors make it very difficult to identify the source of a leak—and usually, they make the repair of the leaks even more difficult. 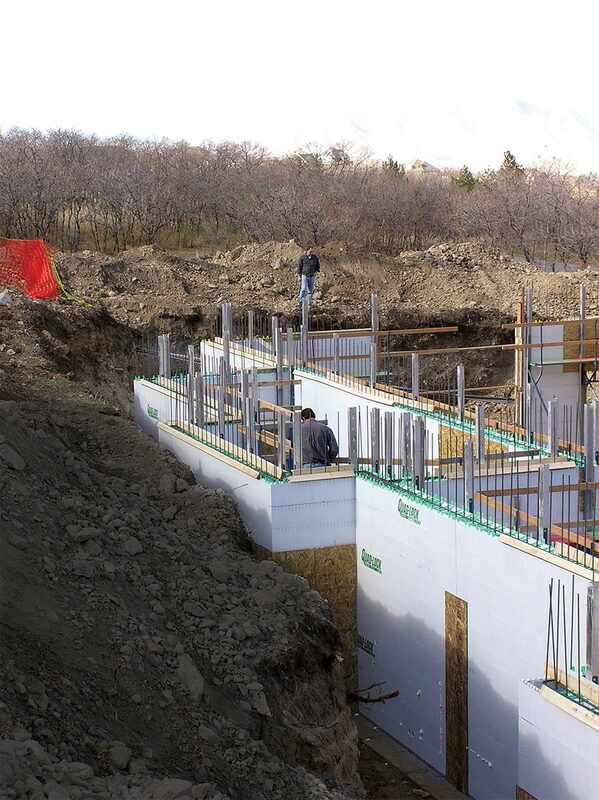 The point is that with ICF construction, it is extremely important to use a quality waterproofing system and install it properly the first time. So what exactly constitutes a quality waterproofing system? A waterproofing membrane that is seamless, flexible and that provides good adhesion on ICF surfaces. Contractors have had good success with water-based, spray-applied membranes as well as the peel-and-stick types. Solvent-based products will destroy the foam—think gasoline in a Styrofoam cup—and must never be used on any ICF. Detailing materials for treating cold joints, transitions, penetrations and repair areas. This is especially crucial if the primary waterproofing membrane is a peel-and-stick. A protection course that is chemical resistant, protects the waterproofing material from backfill damage, and guards against root penetration from plants. A prefabricated drainage board which protects the waterproofing but most importantly, relieves hydrostatic water pressure off of the wall by directing it to the footing drain and away from the structure, either through a sump system or to daylight. Dimple drain boards are popular, but any reputable sheet drain system will work. 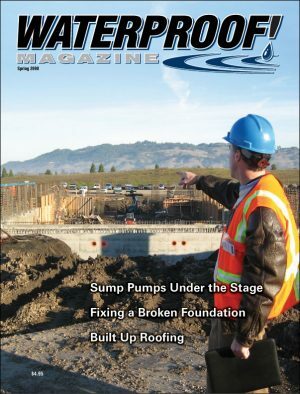 A footing drainage system that effectively collects the water from the wall drainage panels and directs it to a sump pump or to a daylight outlet. 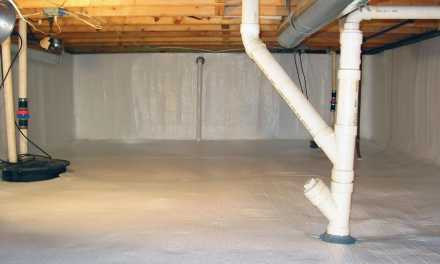 An underslab moisture/vapor barrier that prevents moisture driven through the slab. This last item is especially important in ICF construction because the airtightness of the walls tends to increase the moisture drive through the slab, while decreasing its ability to vent. Make sure all damaged surface areas and edges of the ICF are repaired. Gashes, nicks, and gaps can usually be filled with aerosol foam, then trimmed flush with a razor knife. Pretreat the below-grade portions of the wall with a waterproofing material. 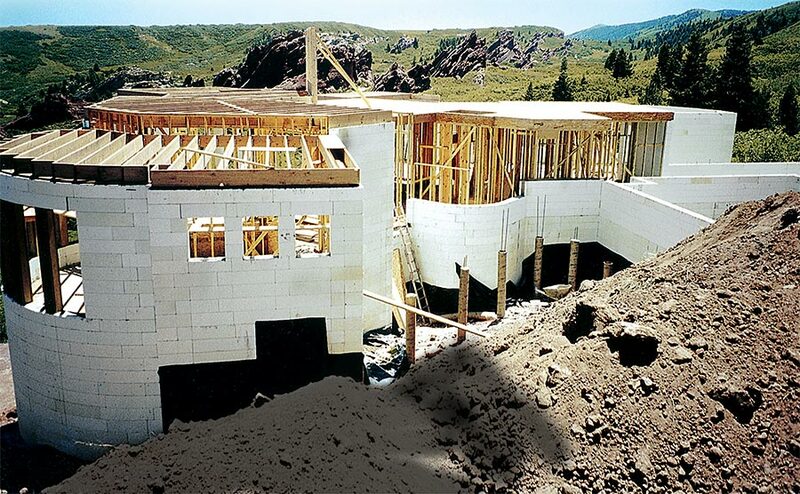 Some ICF manufacturers recommend using a reinforcement fabric over all repaired areas, on the inside and outside corners of the ICF, and at the cold joint between the footing and the wall. Waterproofing: Install the waterproofing membrane according to the manufacturer’s guidelines, ensuring that it is fully adhered and monolithic when completed. It should have enough thickness, or “millage” to provide an effective barrier. Protection: Install the protection course according to the manufacturer’s guidelines, properly securing it to the foundation walls. Drainage Panel: Install the prefabricated drainage panels according to the manufacturer’s guidelines, which should extend from the top of the footer to grade (if possible it should never be more than six inches from the grade line). Vapor Barrier: Install the vapor barrier according to the manufacturer’s guidelines ensuring it is properly seamed together and tied in to the top of the footers with either tape or seam sealer. 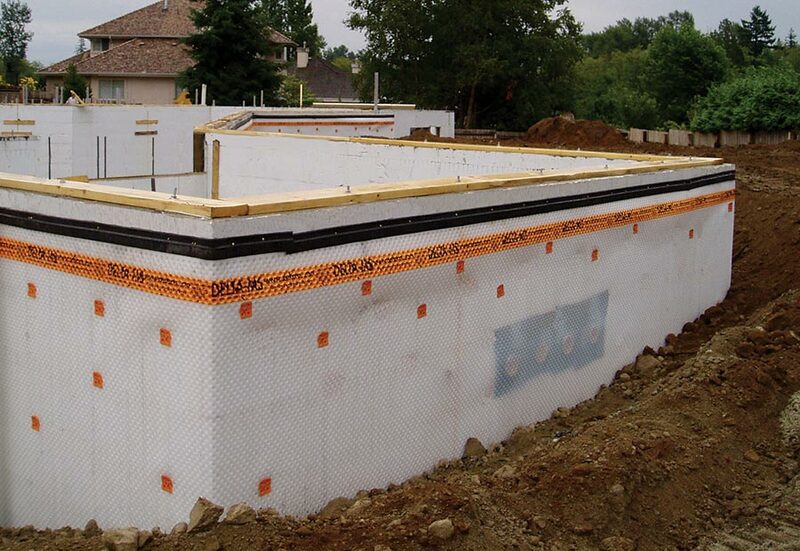 Waterproofing ICFs below grade may be the toughest challenge a contractor faces. Because the concrete is encased in foam, leaks are nearly impossible to trace. The job must be done right the first time. Never backfill or create planting areas above the waterproofing. Landscape and grading are very important. Ensure that the grade is always sloping away from the structure. Never have an irrigation system spraying water directly onto the structure. Periodically verify the dewatering system outlet is functioning (sump pumps or daylight pipes). 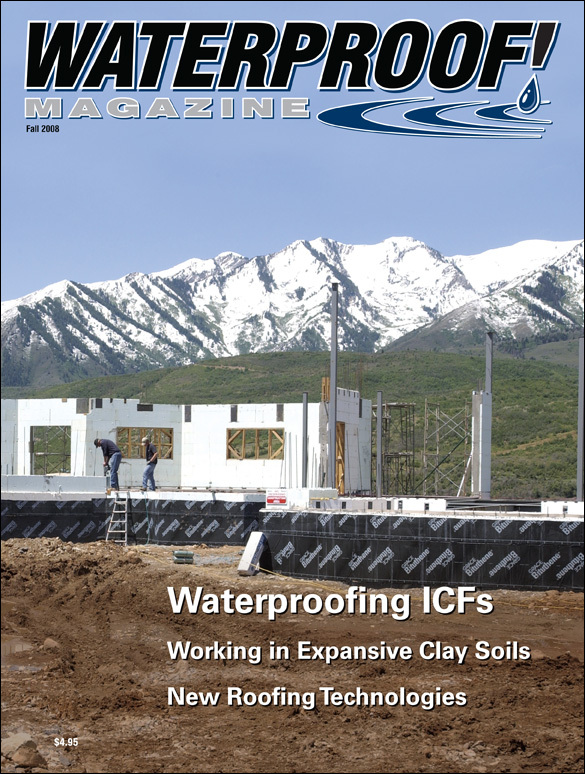 Architects, contractors, and building owners should understand that perfectly waterproofed ICF foundations and basement are feasible. It simply requires an understanding of the potential problem areas, use of quality materials, good jobsite preparation, and careful application. Following these principles not only improves your reputation, but improves the reputation of the entire industry. 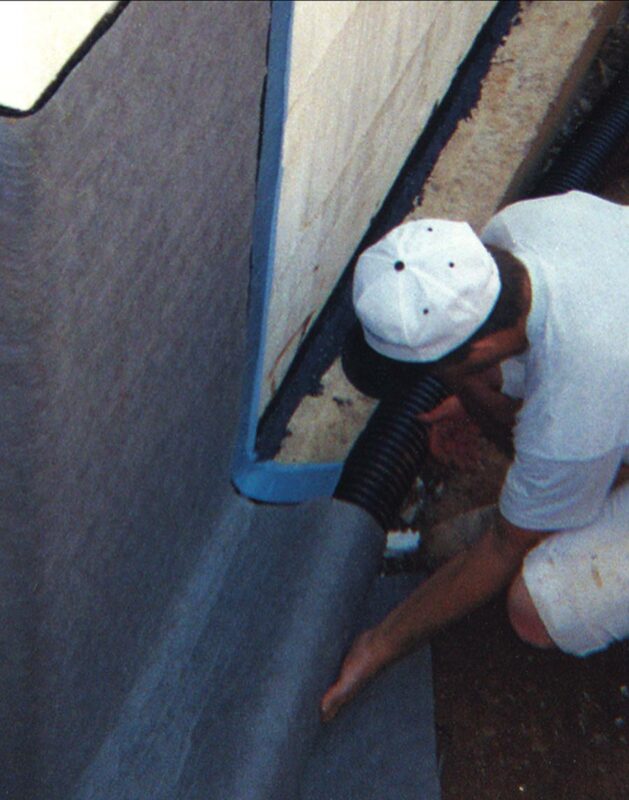 A complete waterproofing system combines an ICF-friendly waterproofing membrane with a sheet drain and drainage tile. 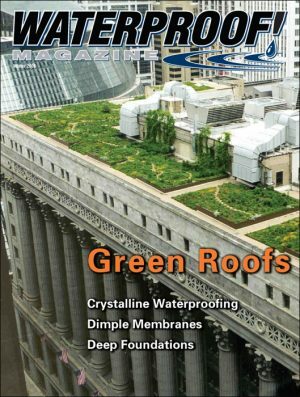 Dave Polk is president of Epro Waterproofing Systems, which manufactures an ICF-friendly spray-on system. He can be reached via phone at (800) 882-1896, or through the company website www.eproserv.com.